UNITED NATIONS (FinalCall.com) - This world body continues to deny any liability for illness and deaths caused by the 2011 spread of cholera experts say UN peacekeepers brought to Haiti and has yet to respond to a letter from 19 members of the U.S. Congress demanding an acknowledgement of its responsibility. “As congressional friends of the people of Haiti, we are deeply concerned about the lack of progress by the United Nations, given its likely role in the introduction of cholera into Haiti,” states the letter to the secretary-general authored by California Congresswoman Maxine Waters (D) and co-signed by Black Democratic House members, including Barbara Lee (California), Yvette Clarke (New York), and Charles Rangel (New York), Frederica S. Wilson (Florida), Alcee L. Hastings (Florida), Bobby L. Rush (Illinois), Keith Ellison (Minnesota) and Donald M. Payne, Jr. (New Jersey). “We therefore urge you to use your office and your influence to ensure that the UN takes responsibility for the introduction of cholera into Haiti and we look forward to your response,” states the May 19 letter. When questioned about the letter June 3, a deputy spokesman for UN Secretary-General Ban Ki-Moon told reporters in Haiti the UN is “doing yeoman’s work,” and did not answer a question concerning whether the secretary-general would respond to the congressional letter. 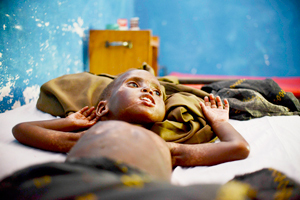 In October 2011, the water-borne disease known as cholera struck the people of Haiti, killing 8,090 while infecting 656,000, as of March, according to the Haitian Health Ministry. Medical experts have said that the disease hadn’t appeared on the Caribbean Island in 100 years, but was introduced by the UN peacekeeping camp manned by Nepalese soldiers. The experts say Nepal had experienced an outbreak of cholera prior to the soldiers’ deployment to Haiti. The UN continued to say the issue of whether its peacekeepers caused the outbreak remained unproven and Feb. 21 announced dismissal of a November 2012 lawsuit filed on behalf of 5,000 Haitian victims of the epidemic. Secretary-General Ban in a letter to the petitioners said their claim was “not receivable.” Observers say the congressional letter was prompted by Mr. Ban’s response to the lawsuit. 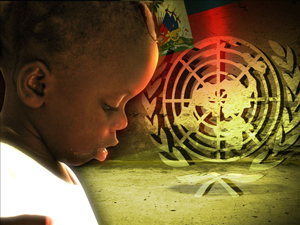 On May 8, the Boston-based Institute for Justice and Democracy in Haiti and the Bureau Des AVOCATS Internationaux in Haiti held a press conference in New York telling reporters about a letter sent to the UN giving the world body 60 days to respond. “We make this offer to the United Nations as a last opportunity to accept responsibility for bringing cholera to Haiti—no response in 60 days—(we will be) taking the fight to court in the UN’s back yard,” an Institute for Justice and Democracy in Haiti spokesperson told reporters. The institute said the court case would be avoided if the UN agrees to a meeting with petitioners and following the meeting agrees to enter into mediation to help resolve damage claims. 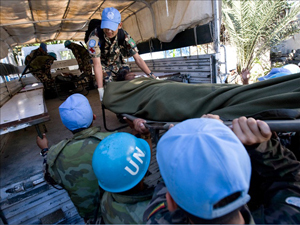 “The UN is legally obligated to consider and settle claims filed by third parties for injury, illness and death attributable to the UN or its peacekeeping forces,” argued the institute. In February, the secretary-general’s spokesman told reporters the issue of the lawsuit was closed and would not be discussed by his office. On June 3, the deputy spokesman was asked to respond to two reports concerning the UN’s lack of progress in dealing with cholera in Haiti. Medecins Sans Frontieres (Doctors Without Borders) issued a report criticizing the UN’s program to bring fresh water and new latrines, water purification systems and cholera vaccinations, saying these programs have had no effect on the ground. “The situation is worse than it was two years ago,” said the MSF/DWB report. The report said health care supplies that turn cholera into an easily treatable disease—antibiotics, intravenous fluids and strong disinfectants—are often non-existent at UN-controlled facilities in Haiti. The second critique came from Physicians for Haiti based at Tufts Medical Center in Boston, in an early May report card that called the UN system for dealing with the Haitian cholera epidemic “dysfunctional.” However, the group added, to the UN’s credit a better surveillance and tracking system for cholera and a pilot vaccination program had been implemented. 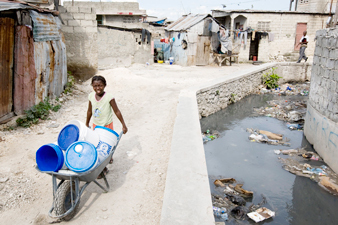 UN efforts have “dwindled” along with international funding affecting programs such as sewage plants the UN helped the Haitian government build. The plants are “barely operational” as the funding dries up, the report card said. Mr. Ban’s deputy spokesperson’s response to the question from the press? “With respect to Haiti MINUSTAH (UN Stabilization Mission in Haiti) is doing yeoman’s work in trying to bring fresh water; in trying to bring water purification systems and bringing cholera vaccination to people. I have seen the reports; we don’t believe the reports. We believe our people,” he said.